...Arriving about midday, following a tree-lined street from the railway towards the town. Halfway down, on the left, a grassy slope descends to a large white building in classical style with a Hebrew inscription running beneath the cornice, and below, in Roman letters, Izraelita Tempeto. Behind the ceremonial hall I find a large Jewish cemetery. The gate swings open, and despite a Beware of the Dog sign, the place is totally deserted. High walls surround it on the other three sides, with narrow concrete paths, edged by earth covered by autumn leaves. Lines of trees make it shady and peaceful. The tombs in the main are quite tall, vertical style stones, in white, black and brown stone, set out quite formally. There is a small Holocaust memorial near the entrance edged by a neatly trimmed box hedge. I continue into town, finding the main street, once called Lenin utca, but which has been changed to Fo utca. I walk the length of the street, unable to find the synagogue, which according to my notes is there, somewhere. Then walking back down the other side of the street, gelati in hand, I spot a Star of David engraved above an arched gateway at number six. Through the gateway and alley into a sunny courtyard, apartments looking down on a cafe and small clothing store. Beyond this another arched gateway, entrances to more apartments, and a padlocked metal gate. Beyond the gate a large yard, cobbled with a grassy patch in the front and a huge old spreading tree in the centre. Behind this a grand old temple, the stonework the worse for wear, requiring a lot of restoration. The schul, so far back off the main street, so secluded behind high walls, has the same lonely atmosphere as the cemetery. Bits of the wall are crumbling away, leaving the unclad bricks. Jews were encouraged to come Nagykanizsa early in the 18th century by the Batthyany family, who wielded great influence in the area. The synagogue is nearly 200 years old. In the adjacent courtyard is a finely restored arcade once featuring Jewish shops, but now home to fashionable boutiques. According to my guidebook, there was a Jewish school behind the schul. 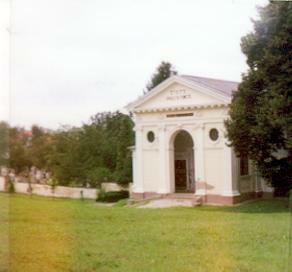 The synagogue now serves as a storeroom, and a venue for concerts. The interior is careworn, but retains a feeling of grandeur, and the sight of it is deeply moving. I am met at the door by an elderly man, who takes me on a detailed tour, despite only speaking Hungarian. There is a domed ceiling, which the guidebook describes as deep blue and studded with gold stars, but now it has faded to a dusty white with only traces of its former splendour, the crisp paint peeling from the edges. There are double balconies on the sides and at the back, edged with delicate metal railings. The galleries are staggered, the lower further forward, the higher, set back beneath an arch which merges neatly with the edges of the dome. From what I can understand from the gentleman, the Nazis kept horses in the schul during the war. The entrance opens from a dark lobby into the temple, beneath one of the side galleries, emerging from beside wide pillars into the light of the central chamber. Above the Ark, still intact, in a classical design with pillars and gold trim, is a large semi-circular window. There are also windows above the three top galleries, all of which make the schul very bright, and its emptiness all the more apparent. The bimah is large, square and raised a step or two above the floor of the room, surrounded by metallic railings. 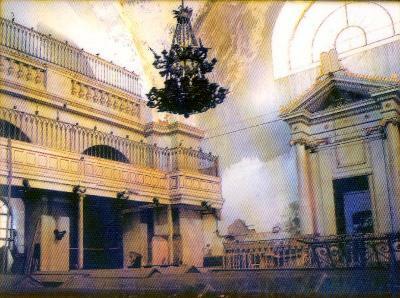 The large crown-like chandelier which once hung in the centre, and which appears in the postcard, is no longer present. 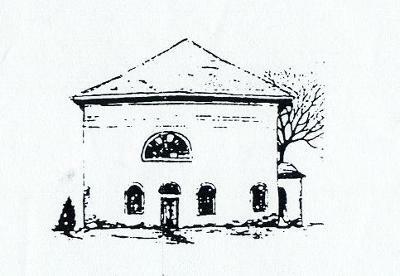 The reformist Hungarian rabbi Lipot Loew served in this schul from 1841 to 1846. 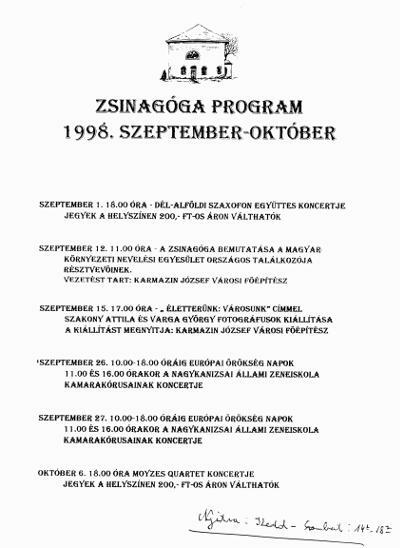 And in 1845 this community was the first in Hungary to have an organ, and it also had a choir. The old gentleman leads me outside, around to the right of the building, to a covered alcove attached to the side of the temple. Here there is a Holocaust memorial to the 2700 who died in the camps, of the total 3000 deported from this town. Also a roll of honour of the many local Jewish soldiers who died in the First World War. Now, only a handful of elderly Jews, like my guide, remain here.